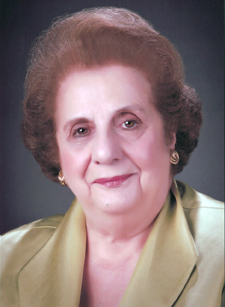 The Loyola University New Orleans Alumni Association will bestow its highest honor to Mary Ann Glorioso Valentino, M’41, long-time New Orleans cultural and civic leader and supporter. Valentino will receive the Adjutor Hominum Award during Loyola’s 2010 Reunion Weekend alumni jazz brunch on Sunday, May 9. The Alumni Association presents the Adjutor Hominum Award to outstanding alumni whose lives exemplify the characteristics that Loyola seeks to form in its graduates, including moral character, service to humanity and unquestionable integrity. A 1941 graduate of Loyola’s College of Music, Valentino is a member and former chair of the College of Music and Fine Arts Visiting Committee. Valentino is also a charter member of Loyola's Alumni Scholarship Gala Committee and a member of Loyola’s Heritage Society. In 2002, she established the Anthony “Val” Valentino Memorial Scholarship to honor the memory of her husband, a 1940 graduate of the College of Music. The scholarship is awarded to an outstanding music composition major in his/her junior or senior year. In addition to her volunteer work with Loyola, Valentino has held leadership positions with many other cultural and civic organizations including St. Michael's Guild, the Sophie Gumbel Guild, the New Orleans Opera Association, the New Orleans Symphony, the Louisiana Arts Council and the YMCA. Her long-standing commitment to Catholic organizations has been widely recognized throughout the years. She received Papal Honors at St. Louis Cathedral in January of 2000. She is also a recipient of the St. Louis Medal, the St. Elizabeth's Guild Volunteer Activist Award and the Most Outstanding Alumna Award from Ursuline Academy. She was named one of the Ten Outstanding People by the Institute for Human Understanding and Woman of the Year by the Heart Ambassadors. She also received an honorary diploma in 1987 from the Academy of the Sacred Heart and an honorary doctorate in 2009 from Holy Cross College in New Orleans. Valentino’s support extends to many other local organizations including Grace House, Parkway Promenade, Strive, Inc., Covenant House, ACCESS, Louisiana Philharmonic Orchestra, the United Way of Greater New Orleans and WLAE.